Barking played out their eighth draw of the season as the points were shared between both sides but each will feel they should have taken all three as they both had good chances to score the winner and break the deadlock especially as the visitors are in a precarious situation with three games to play they sit at the bottom of the Bostik North division six points from Witham Town and safety. A cross from Ogunwamide looped over the Mildenhall goalkeeper Jake Hayhoe and found Alex Teniola just a few yards out and looking destined to open the scoring but he headed onto the underside of the bar and the ball bounced away from danger. Mildenhall took the lead against the run of play after 16 minutes thanks to a stunning volley from 20 yards by Luke Butcher. Barking's task got harder after 39 minutes as Jack Edwards was controversially given his marching orders for a tackle from behind. 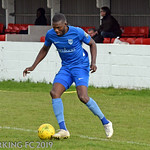 It took just six minutes of the second half for Barking to get their equaliser as Ola Ogunwamide latched onto a long ball from Tobi Joseph outpacing the Mildenhall defence before slotting home for his fourth goal of the season and his first in 2019. Shortly after Abs Seymour’s corner was cleared off the line by Mildenhall’s Andrew Camilo-Tayaca but it was the away side who finished stronger as Thomas Debenham found the side netting and Debenham then forced Brown into a fantastic one handed save from a header back across him. The visitors should have taken all three points late on as a free kick to the far post found Butcher a free man but he somehow headed wide when well placed. We hit the A13 again for third away game running as we visit another rival from our Essex Senior League days in the form of Basildon United kick-off 3pm.